I love to take photos of the garden flowers. Here are two beauties at the edge of the pond. 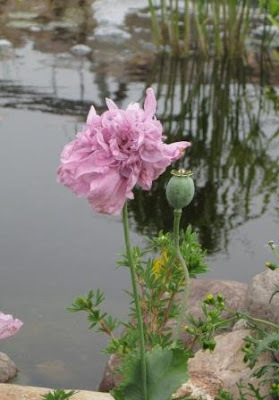 The mauve peony poppies are like weeds and have to be kept down. They self seed and can take over any area. I let a few here and there just come up to fill any empty spots. I got the seeds from the boss's wife (husband's boss- I work for myself/customers). Here is a lily with two blossoms open and two more to come. I have been planting my lily bulbs in pots and then I put the pot in the ground. I have pocket gophers all over the garden. They had tunnels under this one and would have eaten it if not for the pots. 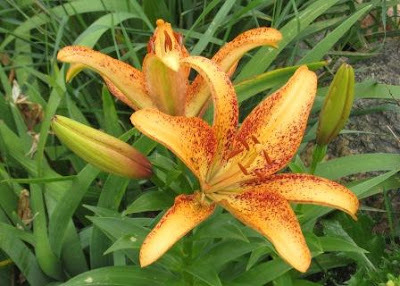 Most lilies not in a pot are eaten now. We have gotten three gophers from this part of the garden. Let's hope they do not come back or dig a hole in the pond liner this winter. We are starting to eat tomatoes and basil from the veggy garden. Peas, lettuces and spinach are done. I will keep you updated on the garden.